If your assemblymember sits on this committee, they need to hear from you before April 9th! Make a brief phone call today (see numbers below) asking them to support AB 1788 and protect wild animals like bobcats, bald eagles, and the endangered Pacific fisher. If your assemblymember does not sit on the committee, please call the committee chair, Asm. Eduardo Garcia. Rodenticides (rat poisons) designed to kill rodents are poisoning California’s native wildlife. Rodenticides are consumed by rats, who in turn are consumed by other wildlife, resulting in secondary poisoning and contamination of the food chain. Rodenticide poisoning is widespread. 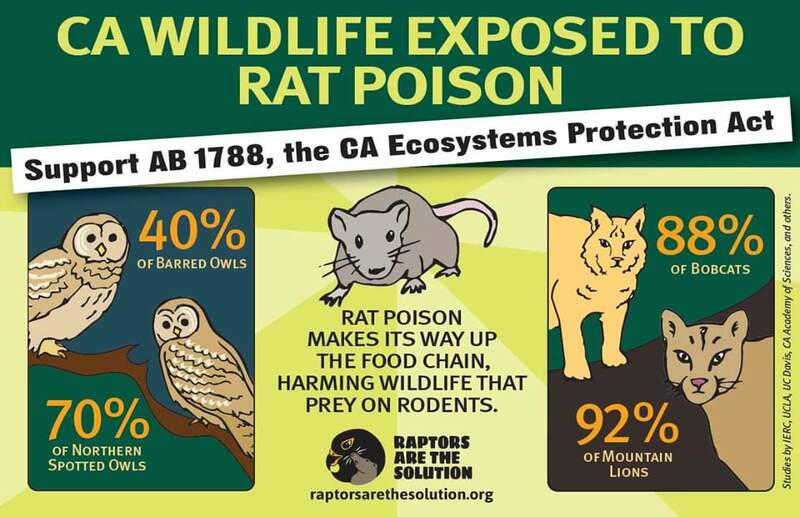 A recent analysis of 11 studies found that more than 85% of California mountain lions, bobcats, and Pacific fishers have been exposed to these dangerous poisons. Thank you to Raptors Are The Solution, for the heads up! [HEAR US] HVCA Meeting question - Stop sign?? Comments : Bold Burglar Stalks HV Resident; Mr. Cook's Sandwich Board Roams the Valley; Cowardly Commenter Strikes Again! What does the Green Ribbon mean?